This is the Dynamite Mach 2 "Big Red" .28 nitro engine, with a Pull/Spin Start Combo and is intended for use in Monster Truck applications. 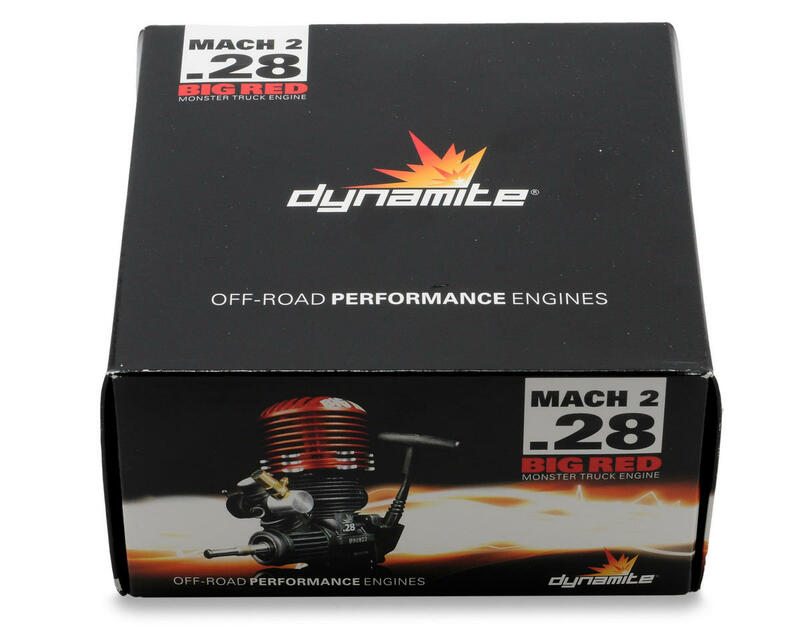 Dynamite's Mach 2 "Big Red" .28 monster truck engine was engineered for superior torque and durability allowing you to unleash the full potential of your nitro monster truck. With features borrowed from the popular Dynamite Platinum series, "Big Red" is a force to be reckoned with. 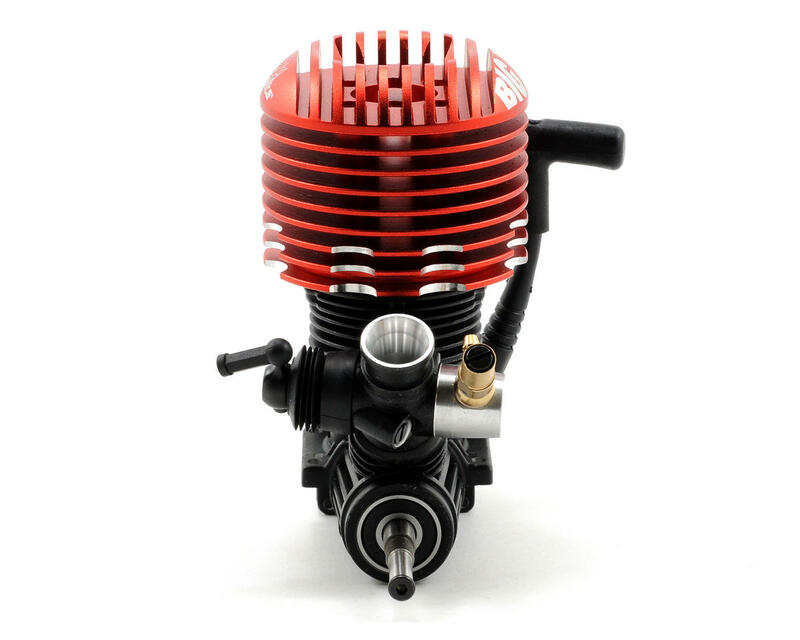 Not only does the engine boast a 13mm turbo ported crankshaft as well as an ABC 6 port piston and sleeve, it also stands out with its oversized aluminum cooling head with "Big Red" etched on the top of the head. 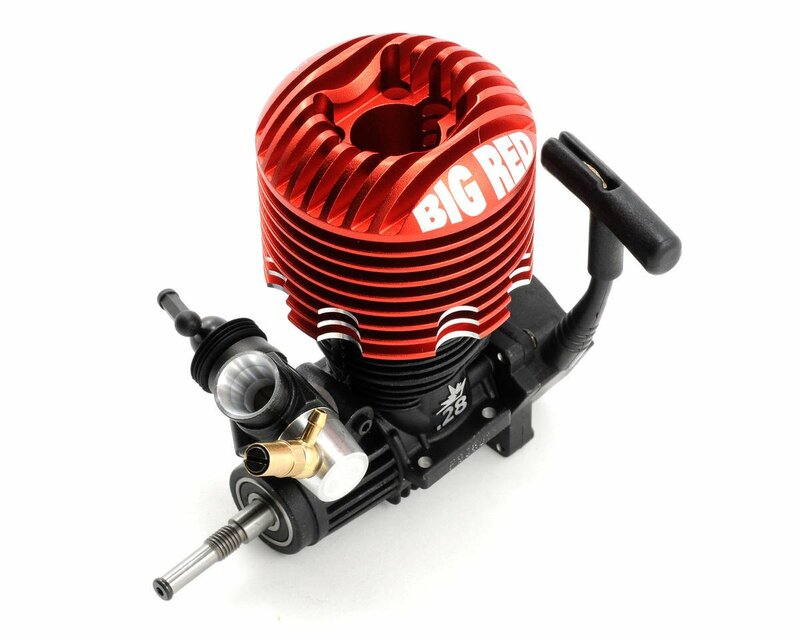 Looking for an affordable, high performance engine for your nitro monster truck, look no further as Dynamite's "Big Red" leaves the competition in the dust. i have had the big red for a little over 3 months now... it has been a great engine. easy tune... idle is a little higher when it gets hot...plenty of power. low end great. and mid to top end i havent noticed any decrease in performance... it is fast and sounds great. love it. This engine is quite good for the money. $150 is too steep though. I got mine back when it was more like $130. The engine breaks in and tunes easily like most SH engines. I have it in my LST2. It probably has a gallon on it, if not a tad less. From what I have seen so far, it has slightly less power than an LRP Spec 3 - especially mid-to-top, but on the other hand seems to drink a bit less fuel. Not sure on the fuel bit, but it kind of seems like it. Pretty sure though the LRP Spec 3 - with more ports - has more oomph. 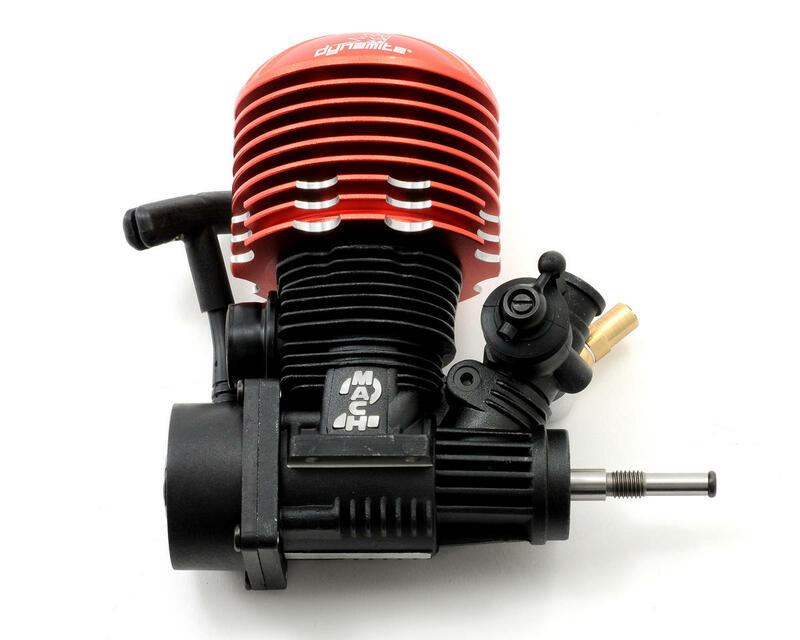 Nevertheles, for the price (when it's around $135) it's a good, low-hassle, reliable, and plenty powerful budget basher MT engine. In a lighter Savage for ex. I'd think it'd be even better. 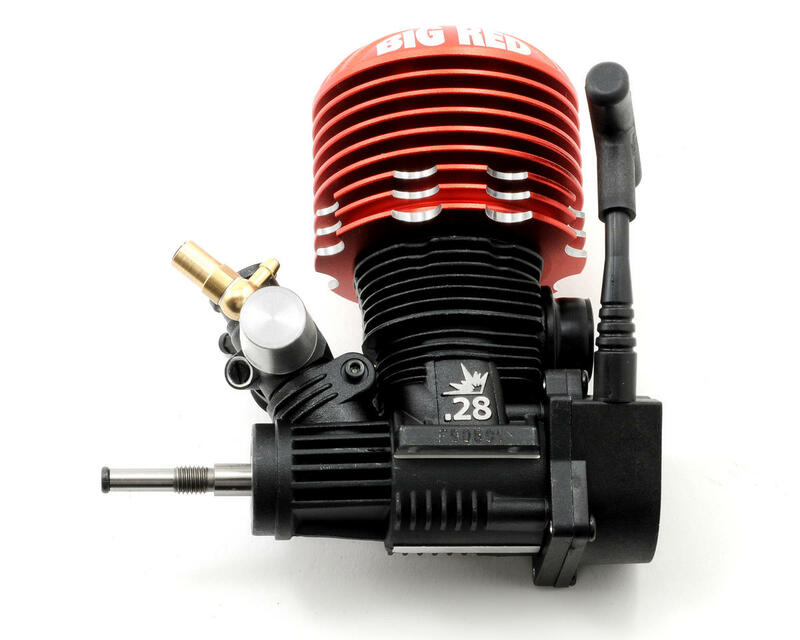 For best power in SH engines btw try an OS A5/#10 plug. 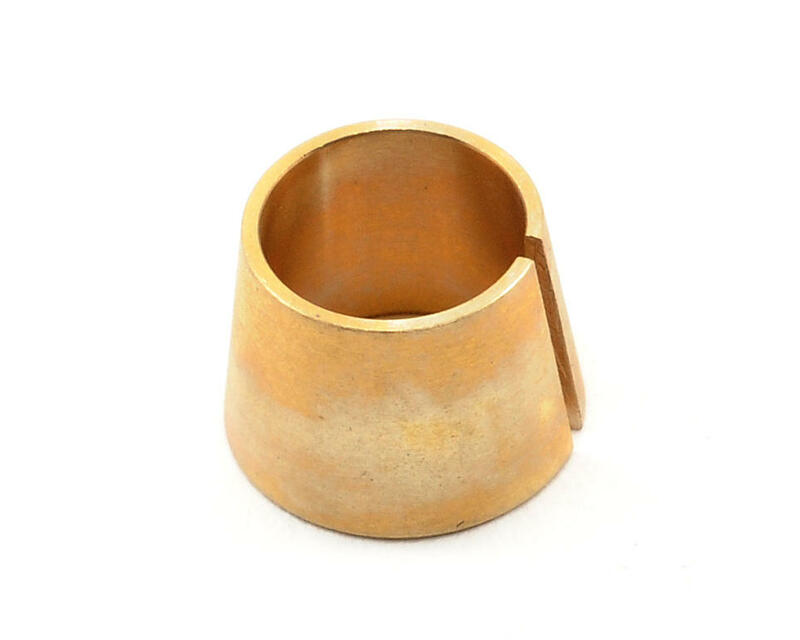 The colder plug improves top-end. Awesome engine! I'm a Revo owner, the TRX3.3 is good, then I had a Picco .26 Maxx which was great, now this one and wow, blows those other engines away, for a Revo size truck this engine belts out so much power you have to up your gear ratio and even then, wow! Really easy to tune, make sure you use a big pipe, well worth the effort to get it to fit... Highly recommended!! easy to tune, and holds tune. very snappy. i have this engine on my aftershock and had to add a wheelie bar to keep it an the ground lol what a beast! What a monster...!! good bottom end and mid...Top end isn't on par with the more higher end mills. But WARNING the pull starter broke on the 7th run..luckily it also has a spin start. In short you get what you pay for. peace out. ive had this engine for about a month or so now . its in my lst2 . tuning is a pain in the as.... once you get it tuned it runs great . break in was easy . ive run almost a gallon through it so far and i dont think its done breaking in yet . its still got too much pinch to use the pull start , wich broke already . while driving it dont like to rev up slowly . if you punch it in my lst2 it does a wheely and will flip over if your not careful lol . Motore molto brillante,facile da carburare robusto,molto performante,ottimo il prezzo sono soddisfatto per l'acquisto. what type and brand glow plug dose this engine use? o motor é realmente um canhão, ainda nem terminei de amaciar, mas já garanto que é um excelente custo-benefício. Porém, o recoil é uma porcaria. Já está falhando, sem nem mesmo estar usando constantemente. o negócio é usar o spin start. No mais, garanto que é uma excelente pedida, tem um torque muito alto e uma final nervosa, acredito que seja graças as 5 portas. Se você for brasileiro pode pegar que garanto que vai dar coro em tudo que é t-maxx e revo que achar. Abraços.